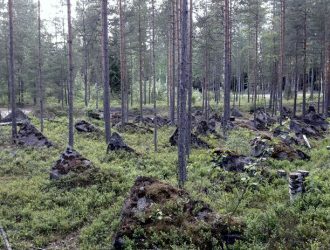 A large part of the Liesjärvi National Park area was used for commercial forestry up until the National Park was established in 1956 so there are many young and middle-aged forests. A significant part of the area’s forests however are over 100 years old. There are few bogs, and three bigger lakes in the National Park; Liesjärvi, Kyynäränjärvi and Tapolanjärvi. Many birds nest in the shores of these lakes. I have never seen a rare flying squirrel (pteromys volans) at Liesjärvi but apparently they also live there. The large hole-nesting aspens along shorelines are perfect places for them to live. 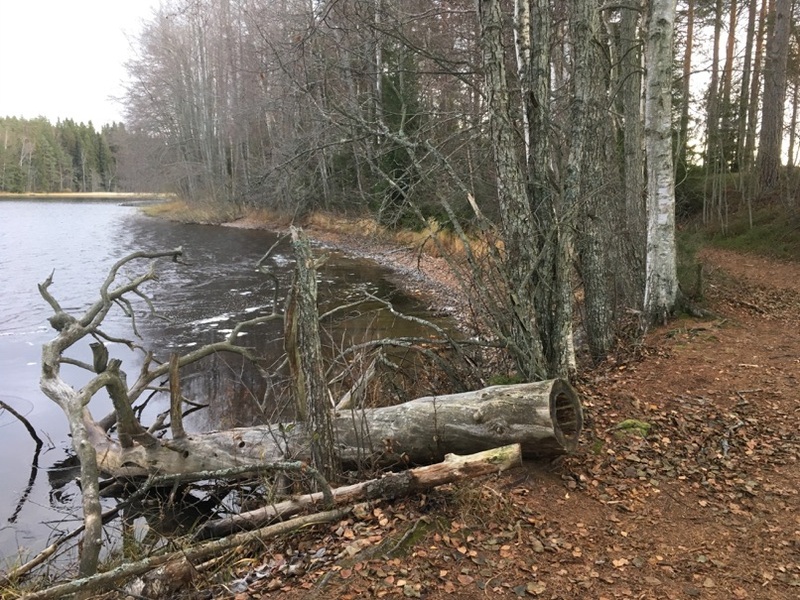 We decided to take our sticks and go nordic walking at Kyynäränharju despite of the cold and windy autumn weather. 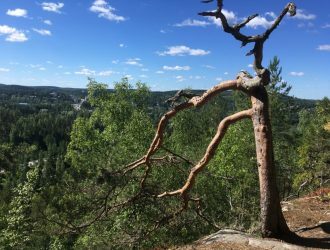 Kyynäränharju ridge was formed during the ice age and it’s a beautiful place to visit especially in the summer. It wasn’t too bad in late October either. In the midway of Kyynäränharju there is a tiny creek, where the two lakes, Kyynäränjärvi and Liesjärvi meet. We didn’t need to get our shoes wet when crossing the creek as a brand new bridge had been built recently. I was wondering why there are so many trees on the ground, but then I realized that we are at a national park, and the trees that have fallen down are only cut and moved aside from the trails but otherwise the forests are left undisturbed. It is also forbidden for visitors to collect or move the fallen trees, and you should stay on the marked trails to avoid disturbing the nature. 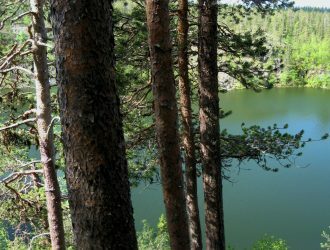 There are about 30 km of marked trails in Liesjärvi National Park. One of the shortest trails is 2,8 km long Hyypiö trail, which departs and returns from the Pirttilahti parking lot. It first crosses Kanteluksentie road and takes you to a scenic hill called Hyypiönkallio, overlooking the Tapolanjärvi lake. This trail is suitable for beginners and children. Korteniemi Heritage Farm is located about 5 km from Pirttilahti, continuing straight from Kopinlahti on the other side of Kyynäränharju ridge. 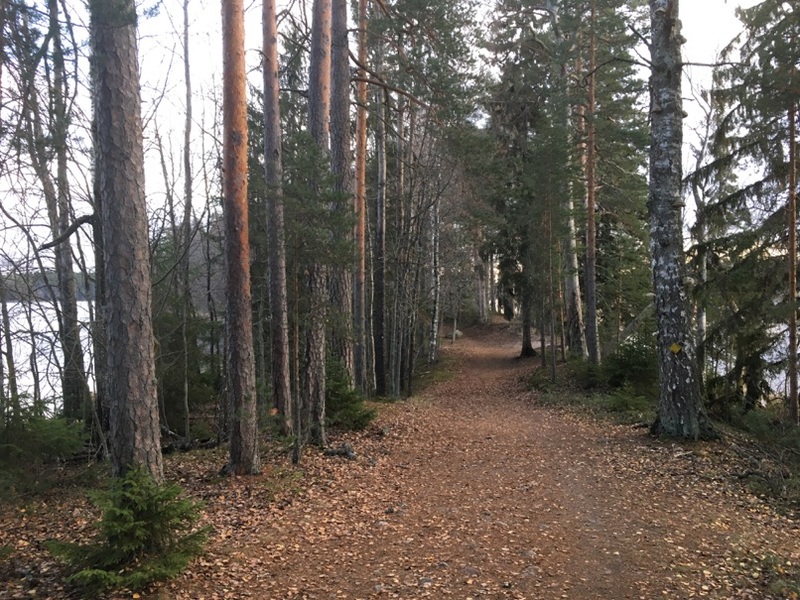 Another three round trails start from Korteniemi Heritage Farm: The Pohjantikka trail (5 km), the Punatulkku trail (3,1 km) and Ahonnokka nature trail (1,3 km). 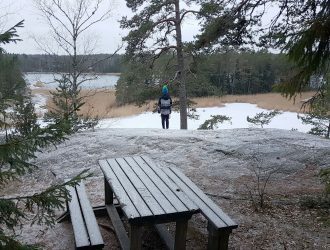 I have also hiked from Pirttilahti to Häme Nature Centre before, but this time the cold weather made us turn back to Pirttilahti pretty soon. I must say that all the trails I have tried at Liesjärvi National Park are well marked and quite easy to follow. 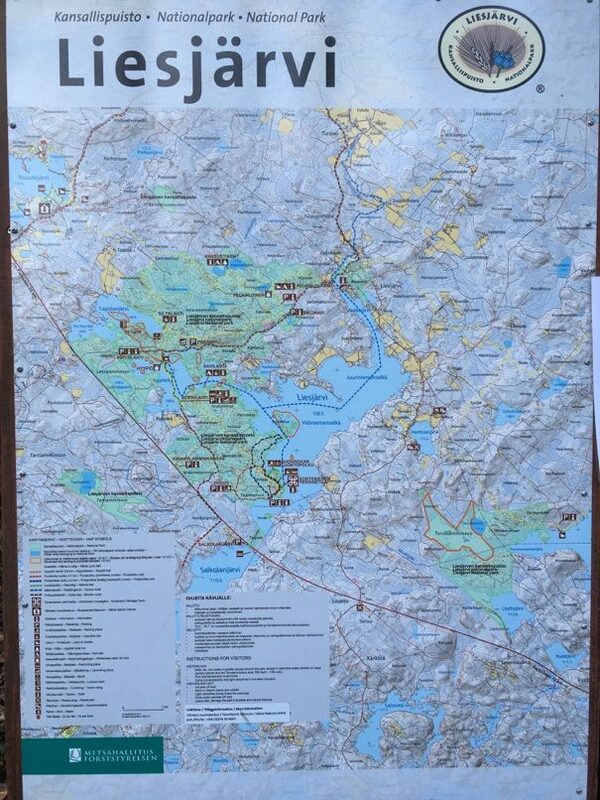 The maps are available at the info boards in several locations. I usually take a photo of the map before starting any trails so that I can later glance it if I need to. The fire places are marked in the map and they can be found at Siltalahti, Korteniemi, Savilahti, Peukaloinen and Kaksvetinen. 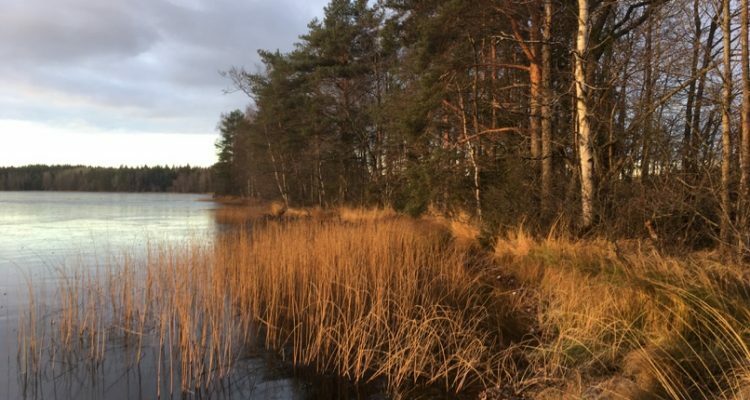 In case you are interested in camping at Liesjärvi National Park when the weather allows, you should know that it is allowed only in certain areas. There is a camping area in Savilahti bay, and camping is also allowed near Peukalolammi and Kaksvetinen barbecue huts. The Liesjärvi National Park actually extends to three municipalities; Tammela, Karkkila and Somero. It is in close proximity to Häme Nature Centre, Eerikkilä Sport & Outdoor Resort, and Korteniemi Heritage Farm. 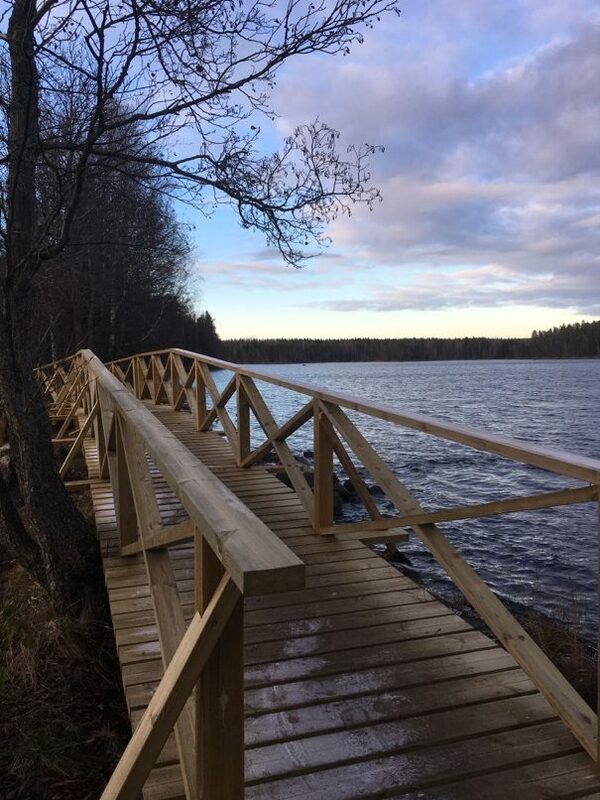 The latter is open only during the summer, but Häme Nature Centre and Liesjärvi National Park provide plenty of activities and sights all year round. Car: Set ‘Pirttilahti Tammela’ or ‘Kanteluksentie 211 Tammela’ in your navigator. You will see a sign by Kanteluksentie road to Kyynäränharju and there is a car park just by the road. Public transport: Getting to Liesjärvi National Park is pretty easy also by public transport as it is located near main road 2. The closest bus stop is called Kyynärä (Tammela), use that when searching for tickets at Matkahuolto. The map below shows the location of the bus stop and how to reach Kyynäränharju from there. It’s about 1,7 km walk, and you arrive to Kyynäränharju from the opposite direction to the Pirttilahti parking area. 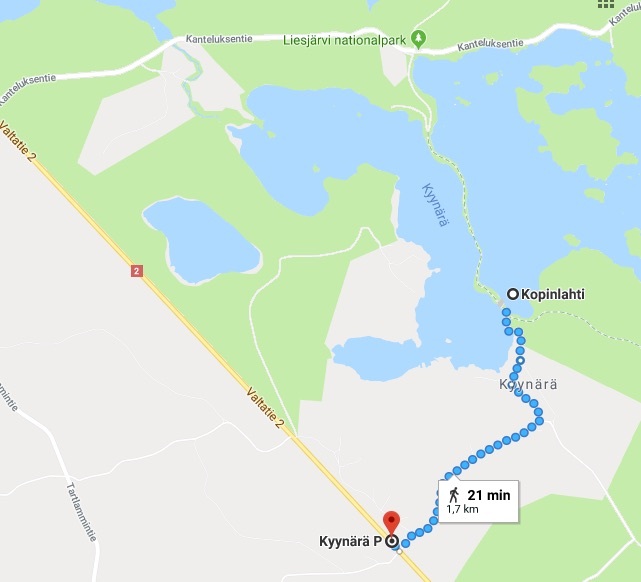 When to go: Best time to visit Kyynäränharju is during the summer as it has picnic tables (and also toilets) in Pirttilahti, Kopinlahti and Korteniemi, and also a nice little beach in Kopinlahti. But the ridge doesn’t disappear during winter months either (other than under the snow) and all parking areas are cleared from the snow during the winter. Even when Korteniemi Heritage Farm is closed, the trails that are leaving from there can be used. Special to remember: You should note that at this time of the year in October and November a moose and deer hunting is on-going. It is advisable to wear red or orange clothes or high visibility vest and tell your whereabouts to any hunters that you may encounter in the forest. Hunting is not usually allowed in national parks (with the exception of Northern Finland), but there might be special permissions granted for hunters, or injured moose may run to national park area thus expanding the hunt there. So be aware of this also at Liesjärvi National Park.